A still film camera is made of three basic elements: an optical element (the lens), a chemical element (the film) and a mechanical element (the camera body itself). As we'll see, the only trick to photography is calibrating and combining these elements in such a way that they record a crisp, recognizable image. 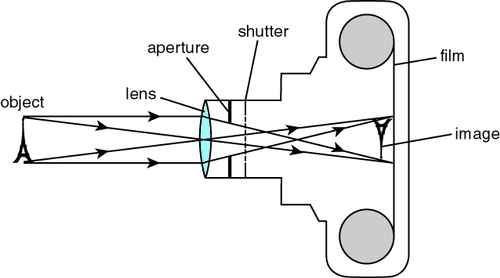 The camera opens the shutter for a certain time, allowing the light to enter through the optical element (lens). Then the light interacts with the chemical element (film or digital sensor), which will record the light, color, etc. As light comes in through the lens it bends, refracts or changes direction causing the image to be flipped.